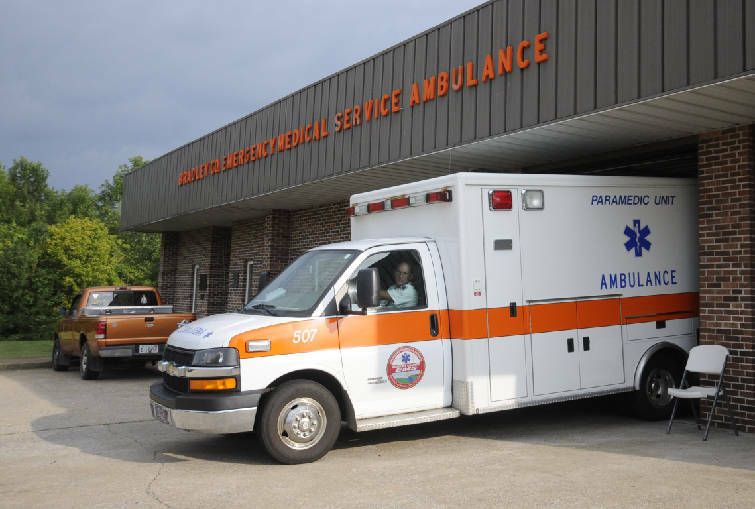 Fire department to reduce medical runs in Cleveland, Tenn.
Jeff Spence, Bradley County paramedic assistant supervisor at Station 1 on Paul Huff Parkway, backs his ambulance into the hall Monday. Beginning Sept. 1, the Cleveland Fire Department will no longer routinely respond to medical emergency calls. CLEVELAND, Tenn. -- Beginning Sept. 1, the Cleveland Fire Department will scale back on the emergency medical calls it answers. The department will not "stop providing medical runs," said City Manager Janice Casteel, but it will cut back on some, allowing other responders such as paramedics to handle them. The move will take some wear and tear off the city fire vehicles, Casteel said. "Many times the scene is crowded because we have ambulances there, firetrucks there and police cars there," she said. Most city firefighters are trained as medical first responders, and, several years ago, the fire department began responding to trauma medical emergencies along with the Bradley County Emergency Medical Service. County ambulances and emergency medical crews are stationed at some city fire halls. None of that service will change, Deputy Fire Chief Steve Haun said. Over time, Haun said, the department's protocol expanded to more types of medical situations. Sometimes, he said, the firetruck's response would be canceled while it was on the way to the scene. Scaling back to the original trauma cases was discussed by city officials during budget sessions this year. "We are just basically trying to cut waste," Haun said. Firefighters will continue providing medical help when an ambulance is not available, he said. "We don't want to cut services to city residents," Haun said. The Sept. 1 date, Casteel said, provides time for meetings and dispatcher training. Contact Randall Higgins at rhiggins@timesfreepress.com or 423-314-1029.